The legendary trumpeter and the acclaimed singer delight Carlyle audiences. The term “legendary” is thrown around a lot but certainly it has to apply to trumpeter Herb Alpert who is appearing with his equally talented wife, singer Lani Hall, at the Café Carlyle. The duo, along with a very talented three member band, opened their latest Carlyle engagement last Tuesday. Alpert performs with confidence but also with a certain sense of humility which belies his enormous accomplishments and impact on the music industry going back decades. Alpert founded A&M Records with Jerry Moss in 1962 (the “A” in the label stands for Alpert and the “M” for Moss). Despite the decision to not sign The Beatles before they were well known in the U.S. (ouch), the label went on to feature such outstanding artists as The Carpenters, Burt Bacharach, Liza Minelli and Joan Baez, to name but a few. One of the highlights of the evening occurred when Alpert performed a series of hits he recorded with the Tijuana Brass. One of the most iconic albums of the 1960’s was the 1965 A&M release of Whipped Cream & Other Delights which featured Alpert and the brass ensemble. (The album cover is equally legendary - it featured an attractive young lady clothed in a small mountain of whipped cream). The record (which sold six million copies) was part of the sonic tapestry that defined the second half of the 1960’s. When Alpert performed a medley of hits from his Tijuana Brass days the audience responded to the selections as if they were greeting old friends. Alpert shared the stage with his lovely and talented wife Lani Hall who sang a smooth series of songs with Portugese and Spanish lyrics. They met 50 years ago when she was making a recording as the lead singer for Sérgio Mendes & Brasil '66. They have been married for the past 42 years and between them have won 11 Grammy Awards. Alpert is 81 but looks and acts much younger. (He joked at one point that 81 is the new 79.) I had the same reaction to Alpert and Hall that I had to the recently reviewed performance of Chita Rivera at the Carlyle. Neither Alpert or Hall seemed overwhelmed or trapped by their unquestionable successes and they seemed genuinely interested in the audience, with Alpert asking several times if the listeners had any questions. Also performing was Bill Cantos on piano, Hussain Jiffry (bass) and Michael Shapiro (drums). Although Herb Alpert and Lani Hall are clearly the headliners, such is the organic quality of the playing that all five musicians seem like equal partners in the performance. Alpert won his ninth Grammy Award in 2014 for his album Steppin’ Out. His most recent album Come Fly With Me was released last year. In addition to original music by Alpert, the new album also contains breezy covers of the title song, Irving Berlin’s “Blue Skies,” and “On the Sunny Side of the Street,” among other selections. The musical texture of the album is reminiscent of the bright and buoyant atmosphere of Alpert’s recordings with the Tijuana Brass. I listened to the album in the morning as I was writing this review and it provided a bouncy and spirited start to the day. Tony award winning actress Lena Hall will be appearing at the Carlyle June 14-25. And Woody Allen’s engagement at the Carlyle has been extended. He will be appearing with the Eddy Davis New Orleans Jazz Band every Monday night at the Carlyle through June 27. 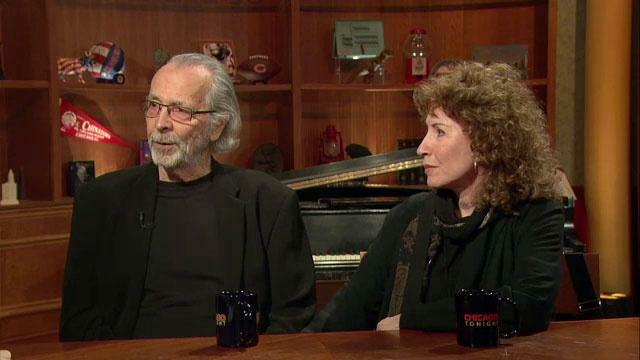 Herb Alpert and Lani Hall will be appearing at the Café Carlyle through June 11. These are performers who seem so at ease with themselves, their talent and each other that it cannot help but have a soothing and yet stimulating effect on those seeking a respite from the frenetic pace of the world oustide. The Café Carlyle is located at 35 East 76 th St. in Manhattan.